Welcome to the Bureau of Alcohol, Tobacco, Firearms and Explosives (ATF) Kansas City Field Division. Our Division is responsible for ATF criminal enforcement and industry regulatory activities in the states of Missouri, Kansas, Nebraska, and the Southern District of Illinois. Our dedicated work force is comprised of special agents, industry operations investigators, certified fire investigators, certified explosives specialists, forensic auditors, explosive enforcement officers, canine handlers, technicians, legal counsel, support staff, and contractors. Read more about the Kansas City Field Division. 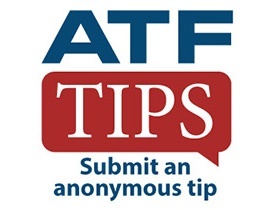 Red, white and blue logo for ATF's tip submission app. The logo's text says, "ATF Tips - Submit an anonymous tip." Text the code ATFKC to 63975 and then follow the link to create a report.